Griffin is a genuine oil color, made with pigments and oil modified alkyd resin, and it can be thinned with traditional oil color solvents. Alkyds' main advantage over oil paints is that they are dry to the touch in 18 to 24 hours. Prussian Blue is a semi-transparent, deep cyan-blue with a greenish undertone and a very high tinting strength unequaled by most pigments. It is similar to Phthalo Blue unless mixed with white, when it gives up intensity and becomes smoky. It can behave erratically and less reliably in oil and watercolor form depending on its manufacture. For permanent painting Phthalo Blue is considered a more reliable choice. Prussian Blue is moderately toxic if ingested. It will emit toxic hydrogen cyanide gas if heated, exposed to ultraviolet radiation, or treated with acid. "The first of the modern pigments," Prussian Blue is the first artificial pigment with a known history. It was discovered by accident in 1704 by the Berlin color maker Heinrich Diesbach, who was trying to create a pigment with a red hue by mixing iron sulfate and potash. The potash Diesbach purchased from a local laboratory had been contaminated by animal oil and blood during previous experimentation. The resulting mixture yielded a very pale red that changed to purple and then deep blue when he tried to concentrate it. Since previous blue pigments came from lapis lazuli, an expensive stone, Diesbach’s discovery was extremely important for artists of the time. Berlin Blue, Bronze Blue, Iron Blue, Paris Blue, Paste Blue. Celestial Blue, Monthier Blue and Soluble Blue are varieties of Prussian Blue. Blue Lake is a reduced or let-down variety of Prussian Blue. Chinese Blue, Milori Blue, and Steel Blue are the three highest grades of Prussian Blue. 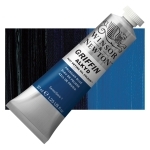 ™ Winsor & Newton is a trademark.™ Griffin is a trademark.